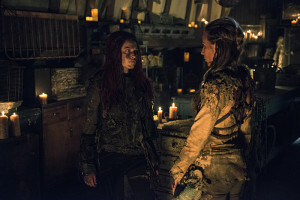 Late last year, we visited the Vancouver sets of The 100 to speak with cast members about the upcoming third season of the show, which premieres Thursday, January 21 on The CW network. The first on-set interview we are sharing from the trip is with Eliza Taylor (Clarke). You can see some video below; if reading text is more your thing, you can do that below the video. Stay tuned to KSiteTV for more interviews in the coming days and be sure to follow @The100_KSiteTV on Twitter for updates on when more are posted! What are you allowed to tell us about what’s coming up for Clarke in The 100 Season 3? That’s a good question! I mean, obviously, we leave off from Season 2 and she is not in the best way. She killed, like, a lot of people. That’s just my way. So, she’s definitely running away from herself, essentially, and I think [in] Season 3, it’s definitely gonna catch up to her, in some good ways and in some bad. But I’m just really excited about us exploring more of the post-apocalyptic world. Clarke’s definitely — she gets to explore a lot more than she has in other seasons. We saw a photo of you in full Grounder dress and makeup. Will you be spending more time with the Grounders this year? Yeah, definitely spending more time with the Grounders. It’s hard to be away from Arkadia and not bump into them. So, yeah. That’s pretty exciting. That photo that was released, we were really hoping it wouldn’t be, but I guess it’s given people more to look forward to. Is there anything you hope to explore or see or do in this world? Yeah. We get to go to the Grounder Capital, so that’s pretty cool, and the sets that we have for that are just amazing. Obviously I can’t divulge too much about them, but I think people are going to be really happy. How long do we have to wait for a reunion with Clarke and Lexa? A while. [Laughs] I don’t know what I’m allowed to say! But it’s pretty great that we got Alycia [Debnam-Carey] back, and we’ve shot some pretty cool stuff. What episode are you on? We’re shooting 9 at the moment. Yes. We’re halfway through, which is cool. I can’t believe it’s gone so quickly. Can you talk about Clarke’s mindset in regards to Lexa? I have a lot of faith in Clarke’s forgiving power and humanity, so yeah, I think that that is definitely a possibility, but she’s not going to be in a good way when she sees her again, that’s for sure. There’s a lot to work out. What is her own state of mind at the start of the season? I think she’s just in survival mode and in denial about anything that’s happened. She’s just kind of taken off on her own and is just all about getting somewhere to sleep and eat, living off of the land, which is pretty cool. Can you talk about what the reunion will be like when she sees Bellamy again? I think Bellamy is going to be pretty disappointed in her. She abandoned not just him, but the rest of our people, and left him to pick up after her… clean up her mess, essentially. So, he’s not exactly going to be thrilled to see her. Even after what she had to do? Well, they did it together, right? So while he understands, I think he’s still very disappointed that she didn’t stay by his side. Do you think part of the reason why she left is because of all the guilt that she had over what happened, and she just needed to decompress? Yeah. I think so. Definitely. A lot of guilt. How does the society that Clarke has left, view her? You’d have to ask them. I’m not sure. I don’t know what their reaction is going to be, or how they’re viewing her. Have you gotten to do any particularly fun or exciting stunts this year? I always get to do fun stuff. Yeah. It hasn’t been quite as physical for me, but Episode 1, you’re definitely going to see some rough and tumble, which was really fun. And what can you say of your costumes this season? There have been quite a few changes, actually, which has been really fun for me. I mean, first season I did not change my outfit at all. Season 2, got a little bit more… and this year, it’s like… yeah. Full-on… it’s cool. 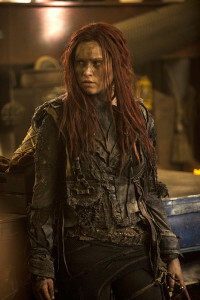 She’s definitely trying to blend in to Grounder society, so there’s a bit more of the leather; a bit more of the armor. It’s cool. Have you gotten to work with Brenda Strong as the Ice Queen? Yes! She’s so good! She was amazing. She is everything you would want the Ice Queen to be. She’s terrifying. It’s awesome. In what you’ve shot so far, should fans be worried that all of the series regulars might not make it through Episode Nine? That’s the thing about our show. You just never know who’s gonna go. But yeah. I think there’ll be some pretty cool deaths. As per usual! What are the chances of Clarke returning to be with everyone else? I would like to see that. It’s so funny, being so far removed from that; from Arcadia… I’m not sure if we will get a reunion. I mean, I’m sure. It would make sense. But, yeah. It’s so weird that I’ve been so far away from the whole group. It’s bizarre. But I would like to see that. I think that Abby and Clarke… I love working with Paige [Turco], and I feel like we have a really good dynamic on the screen, so, fingers crossed. I think she’s just too terrified to face everyone, but I’m sure deep down, she’d be missing her mom, for sure. And the society she worked so hard at building from Season 1 onwards. 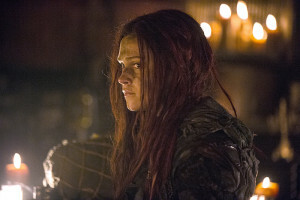 Are there other interesting characters that Clarke will be interacting with her in her story? Yeah, there are a few new cast. I’ve had a lot of fun with Zack McGowan from Black Sails. He’s great. And then Brenda [Strong] and a couple of others who have been thrown into the mix, who have just been really fantastic to work with. So yeah, you’ll see some new relationships building. Are you jealous of your castmates who get to do a lot more studio-bound action rather than being outside all the time? No, I like it outside. I mean, being in the studio for 15 hours, you can get a bit, like, [tired] you know, because it’s dark all day, and you spend so long inside, but when you’re outside, at least you have fresh air and a breeze, to keep you awake and alert, especially as we’re going into winter. How are things with Jasper after what Clarke did? I killed his girlfriend, so I can’t imagine he’ll be too impressed with me. Apparently Jasper is now in a much darker place, which will be really weird to see. “What happened to our comic relief? Now we have none!” But he’s such a good actor; he’s gonna do great. What’s Clarke’s kill count for this season so far? I don’t know! I don’t think I’ve killed as many people, that’s for sure. It’s pretty low at the moment. Are there any more flashbacks coming in for Clarke this season? Not that I’m aware of, no. I don’t know even if the other guys are doing that. I love the flashback stuff. That was so fun to shoot. And I loved playing with Chris who played my dad. I wanted to bring him back, but alas, they have not, yet. 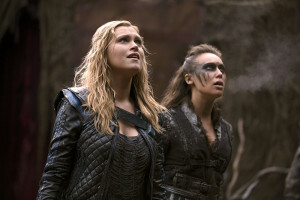 The 100 Season 3 premieres January 21 on The CW. Come back soon for more interviews! Photos from the season premiere can be found here.